Subject: 2nd. Edition - What's the difference and first thoughts. Canal Mania was first produced by Ragnar Bothers in 2006 as a limited run of 1000 copies. The game was a great success so a second revised edition has been produced, this one available as a complete game (another 1000 copies) or as an upgrade kit for owners of the first edition providing all the necessary parts to play the revised game with a first edition set. I picked up my copy of the upgrade kit at last weekend’s UK Games Expo and got the chance to play the game, so in light of that here are my first thoughts on the new edition as compared to the first. 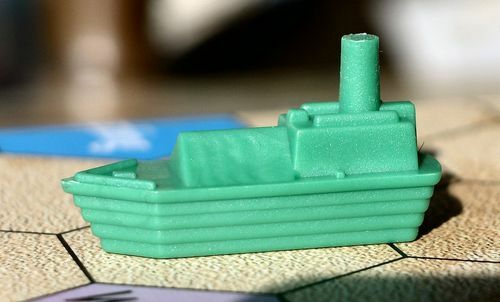 Those who do not know the game will find more information elsewhere, but in brief, this is a game concerned with building canals on a map of England, victory points being scored for the building of the canals themselves and then for using the canals to move goods between the towns and cities on the board. Canals are built by playing hexagonal tiles in the player’s colour representing different types of construction (stretch, lock, aqueduct and tunnel) using cards corresponding to those types. Canals may not be built anywhere on the board, but the player must have a contract specifying the start and finish of the canal, together with any town it must go via. Goods come on to the board when certain build cards are drawn by the players and are placed on towns and cities. They may be moved to another town or city along canals, providing the route does not include more than one town of the same colour, and victory points are scored according to the number of towns in the route (which may include other players’ canals) that connect to the canals used. Players are aided in their actions by one of 5 great engineers who may be swapped around during play, each giving a different advantage. So how does the second edition differ? 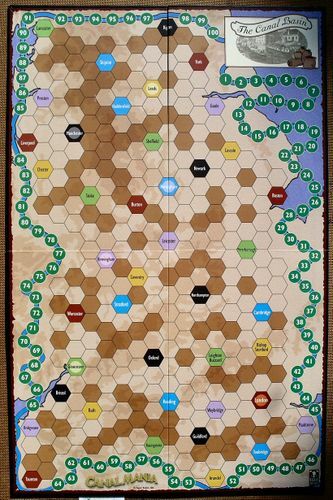 The new board lacks the little pictures in various places, which to my mind, makes it look a bit more drab than the old, also missing are the pre-printed spaces on the score track for the end trigger points (there is now a hexagonal counter showing a steam engine (not in the upgrade kit) to mark this). As to geography, the Welsh town of Llangollen has disappeared along with the two hexes north of it and the two hexes south east. So there is still the same number of towns, the town of Newark has been introduced between Nottingham and Lincoln. Llangollen was a violet town, Newark is black and, by my count, 17 of the other towns have changed colour to balance things up. The changes are mostly in the north, the south east being virtually unchanged. One other change is that York has been moved 1 hex to the north east. It will take a few plays to get a handle on the effect of the board changes, but one thing I did notice was that it may now be more viable to try and include York in the route of the “The Rochdale Canal and Calder, Hebble & Aire Navigations” as Huddersfield has changed to blue so is no longer the same colour as York. With the loss of Llangollen, the Llangollen Canal (value 4) is gone and this is replaced by the Trent Navigation (value 5) between Nottingham and Goole, via Newark. The upshot of this is that there is one fewer potential link to Stoke and one more to each of Nottingham and Goole (possibly also Lincoln, removing the isolation of The Fossdyke Navigation). 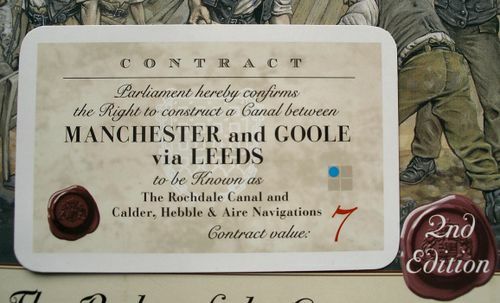 The new contract cards have a symbol consisting of 4 small squares, with one highlighted in blue to show in which quarter of the board the canal is located which will help those who may not know England so well. Finally there are now 5 junction contracts (one per player) which I will mention later. The upgrade kit actually includes a full set of all the cards needed to play including build cards, engineers and reference cards (of which there are now 5), so anyone going this route will now have spare copies of the other types of cards. All the new cards seem to be slightly thicker than in the old game. The first edition was criticised by many for the plastic tug boats instead of narrow boats. This never particularly bothered me but the new pieces are now nice representations of steam narrow boats, which I certainly agree are more appropriate. This is much the same as before with the following exceptions. 1. There is now the option to play with 2, which would have been doable anyway. 2. 20 goods tokens (which were provided anyway in the first edition) are now available to be placed on the board, rather than 15. Corresponding to this it is highly unlikely that goods will run out, so the goods removal rule has been removed. If you need to place goods and they are not available the rule is now that goods are not placed. 3. The value of a completed contract is now added to the players score in addition to the value for the sections of the canal, resulting in a change in the balance between scoring for building and goods movement. Together with this the end bonus for most prolific constructor has gone and the end game trigger values have been increased by 10 reflecting the extra points available for canal building. Because these triggers are now represented by a movable counter there is also the possibility of adjusting the value for a longer or shorter game. The alternative end condition of turning up the 5 last contracts has been removed, but I personally never saw this happen anyway. 4. To reduce the effect of luck with the contract draw, a player now has the option to take his junction contract (in a 2 player game he has 2) instead of taking a contract from parliament, but not as the extra contract he could take if he had already taken one from parliament with only 2 or 1 remaining. The junction contract has value 2 and must include only 2 towns or cities. The introduction of these contracts is twofold as it allows players to link unconnected sections of their networks and gives them an alternative if they are forced to take a contract and there are no useful ones available in parliament. 5. 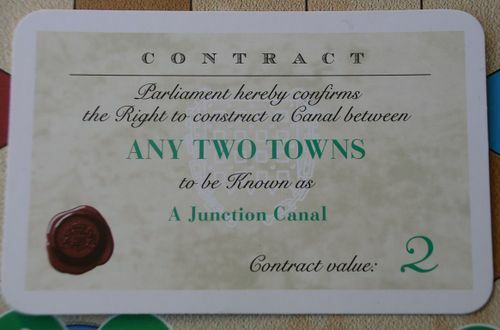 The junction contracts increase the probability of forming loops so a rule has been introduced stating that if a player has 2 possible routes between 2 towns or cities both using his canals only, he must choose the least valuable. 6. The tie breaker is now the most prolific constructor of canals as determined by the rules for that bonus in the first edition, the old tie break is used only if this does not decide the winner. So does this new edition improve on the original or not? To my way of thinking the answer would be yes. Although there are a couple of things I don’t like, these are subjective and do not really bear on the play of the game, I’ll get them out of the way first. I was a fan of the Llangollen canal and it was nice to imagine I was building the wonderful Pontcysyllte aqueduct; this is gone in the 2nd edition. Also I was rather fond of the little illustrations, which added something to the board in my view. That’s it for the minus points, on the plus side the new cards are of slightly better quality and although I was never overly bothered, it’s nice to have the narrow boats. It’s also good to have 5 reference cards instead of having to share 2 around. On the evidence of limited play, the shift of the balance towards building canals rather than shipping goods seems to have reduced the tendency for a runaway leader which I have sometimes seen in the past. The game was very close until just before the end. Also junction contracts do help mitigate the effect of getting bad contracts (but not entirely). Another effect of the junctions is that none of the canals is inevitably going to be isolated, which I would class as a good thing. So on balance this seems to be an improved product. Of course I already rated the original as a 9 so I’ll have to think a bit more about whether to raise that. The junction canal cards seem like a very, very good idea, I'm glad they were added. A great review of a great game. I played this for the first time at the UK Games Expo on Saturday night and i was very impressed. My friend got hold of a copy so i'll be making sure that he brings it to the table in the future. I've just completed the first play of the second edition and it doesn't solve runaway leaders. I managed to get in to the lead fairly early on and from then on it was a procession as my canals formed a good network and most turns I was able to ship a good for 5 points. It may have been I was just exceptionally lucky with the cards - but I think I will have to play again to see if something similar happens. That is the situation I've frequently seen in 1st edition play and from your comments it can obviously still happen. I would have thought it less likely due to what I percieve as a shift of the balance of scoring away from shipping in the direction of building and also the junction contracts allowing the potential for more players to have good networks. The runaway leader is, I believe, something which opposing players can reduce to a certain extent. However during the one game we had (four players) the endgame arrived way too early for us to do anything about it. Technically there was no runaway leader as there were two players jostling for first; but the other two were clearly out of contention simply due to having longer canal contracts for most of the game (which finished quickly enough that the contracts remained open). I suspect moving the endgame marker up on the scoring track will alleviate this problem; the question is would the suggested 10 point raise be enough? I think in my case (a 4 player game with me going last) the problem was that they left me Gloucester-Worcester and Worcester-Birmingham. Which I built together and shipped immediately. Worcester-Birmingham went through two other towns so I was well set. My next contract was Oxford - London via Reading which was built a single turn after I picked it up. After that point I was able to ship for 4 or 5 points virtually every turn. Having played over 10 games of Canal Mania now, both first and second edition, we find the game so well balanced and that the 3 of us are fairly equal in skill that the winner is decided by the luck of the card draw. We are aware of the possible ploys and strategies and so nobody ever manages a run away lead. Its a shame because i do enjoy the game and the theme but usually after a 2 hours play, the person who draws the most surveyors wins. maybe remove one or 2 surveyor cards?